This is the beautiful and talented Gabriella Versace. She has a very powerful voice and sings dead on key. I don't usually enjoy shooting people, but photographing Gabriella Versace was unbelievably easy. I took these photos in Las Vegas at when I worked with Ed Roman and we were the "World's Biggest Guitar Store." 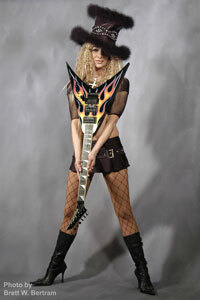 She's pictured here with some high-end and boutique guitars from various builders. Gabriella was beautiful, naturally photogenic and very gracious.